I’m just going to go ahead and apologize right now before I go any further. I’m sort of on a comfort food (you know, high calorie, delicious, and unhealthy food) kick right now, (maybe because the weather is getting cooler?) and there is absolutely nothing healthy about this dish. Actually, you could make it significantly healthier depending on what type of ingredients you choose to use (skim milk instead of cream, less cheese, and not over-indulging), but I’m not going to lie and tell you I made any of those choices. This is pure, delicious, evil. There was a long (-ish) period where the hubs and I should have bought some stock in Lipton. We were investing that much money. When I was first married those little side-dish pasta packets were an automatic go-to of mine for dinner. Except in our little world, while we were figuring everything out, including learning to cook and figure out a monthly food budget, they weren’t really sides so much as a meal and, man, did we love em. Sure, one package allowed us to reach our sodium limit for a month, but I’m sure that’s what made them so tasty. After a few years went by, we had learned a few things. 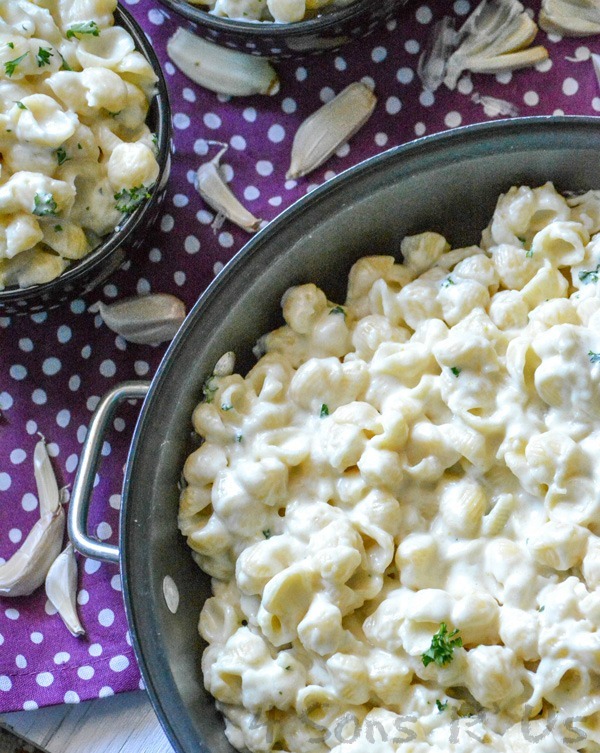 Those pasta sides got kicked to the curb in favor of more and more homemade versions, that we came to find tasted better and were loads cheaper, especially for a large, expanding family. So here’s all that delicious (and still very convenient) taste, without the copious amounts of sodium, and without requiring you to purchase a pasta packet. 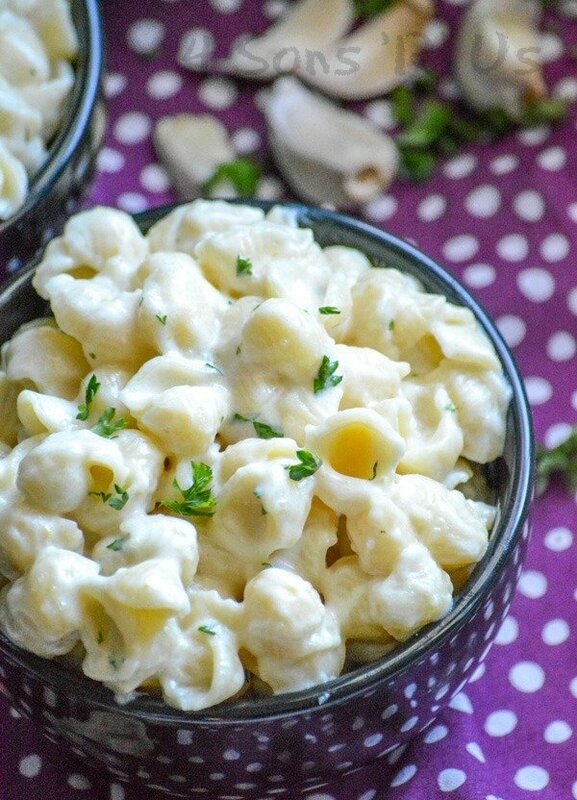 A quick and easy dish, this yummy recipe features small shells stirred into a creamy Parmesan garlic sauce. Cook pasta in a pot of salted, boiling water until al dente. Drain, then set aside. Let pot cool off the heat for several minutes. Return pot to stove over medium heat then melt butter in olive oil. Add garlic then saute until golden brown, about 30 seconds, being very careful not to burn. Sprinkle in flour then whisk and cook for 1 minute. Slowly pour in chicken broth and milk while whisking until mixture is smooth. Season with salt & pepper then switch to a spoon and stir constantly until mixture is thick and bubbly, about 4-5 minutes. 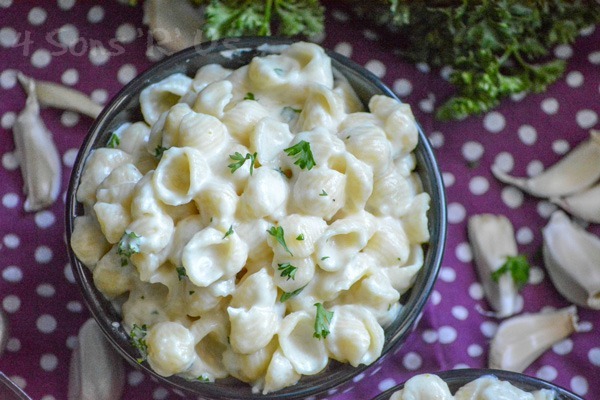 Take pot off the heat then stir in parmesan cheese, garlic powder, and parsley flakes until smooth then add cooked pasta and stir to combine. 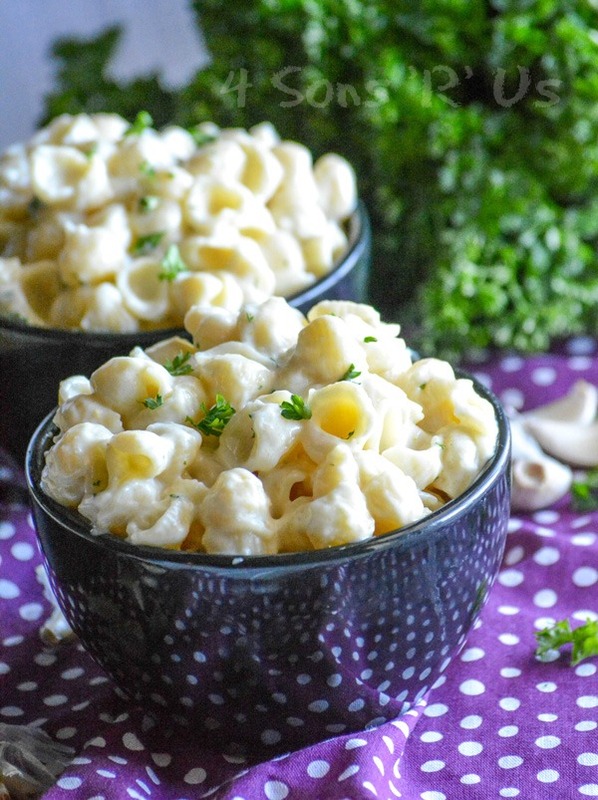 Ahhhhh yummy – I love simple creamy pastas like this – right up my street!! Pure out and out comfort food, mac and cheese as far as I’m concerned, but 10 times better with your sauce! Thank you for bringing to the party and have a wonderful weekend!!! 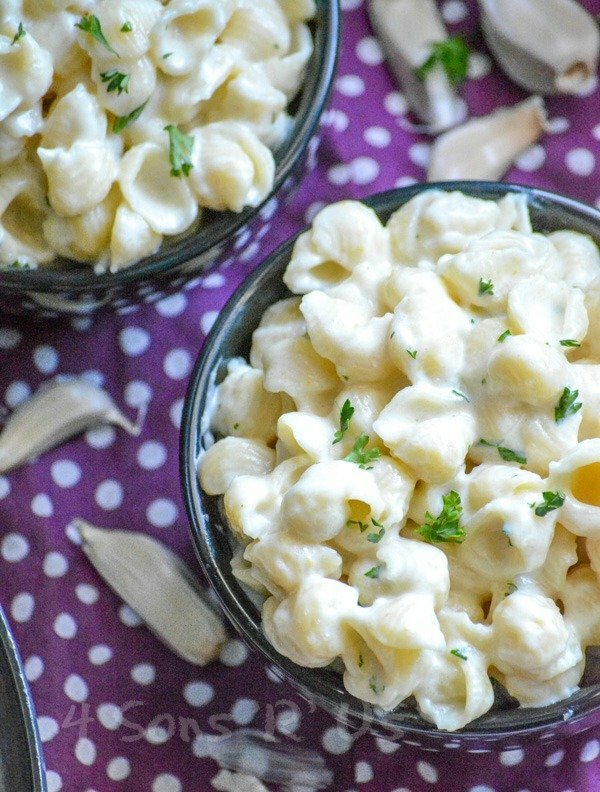 Garlic is my favorite! 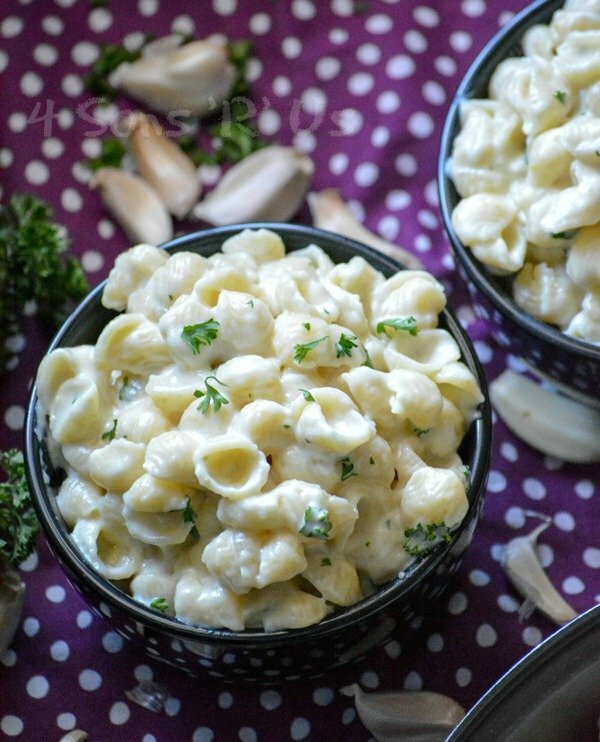 A creamy comfort food like this is sure to be a hit, so delicious! Pinned for later, Thanks! We put in everything! Well not everrrything, but ya get the idea. Thanks for the love, Alison and I can’t wait to hear your final thoughts. So creamy and gooey looking! Pinning… I know this will be a favorite here! 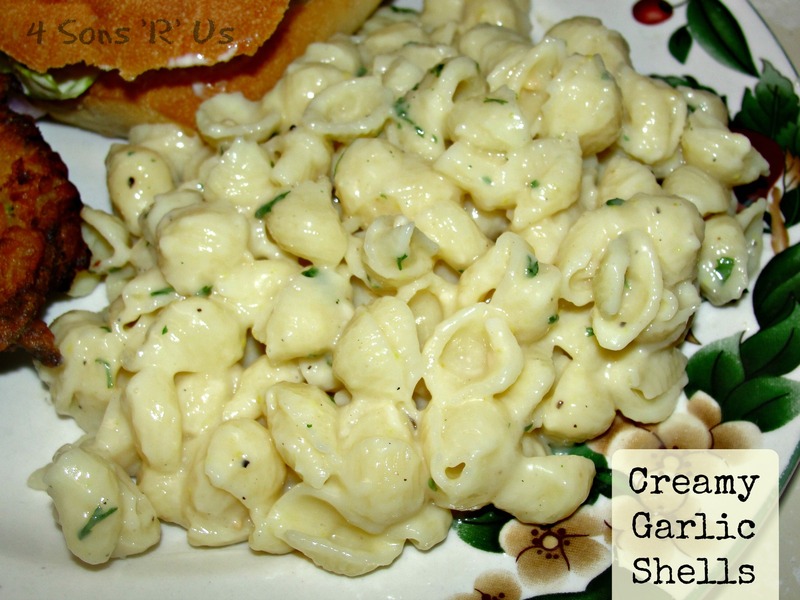 I was looking for a recipe for shells, peas and pasta salad, but came across this creamy garlic shell pasta recipe to make instead. Made this recipe instead and added peas. Came out delicious. So happy you found & enjoyed our recipe, Richard. I can totally picture peas in this and it sounds delicious. Next time I make it for my guys, I will definitely be giving your version a try! Thank you for sharing this recipe! I needed a side dish and knew I had pasta shells in the pantry so I googled pasta shell side dish and your port popped up.